Hi there! Yesterday I had the chance to head up to Twain Harte with my neighbor Alice-Jane. Twain Harte is a cute little town in the Sierra Foothills, and a particular favorite of my family. 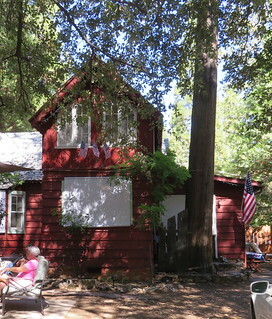 Cathy's cabin is tucked into a sweet little neighborhood near the lake. It couldn't be more charming, with its red exterior and vine covered entrance. There's a lovely covered area for outdoor seating and we spent the morning there sipping iced tea and catching up. After lunch at the Little Cottage Café downtown, we walked through some shops then headed over to the famous Twain Harte Pharmacy. The pharmacy has just about everything you could want, including a nice selection of fabric! I even found a few pieces of Sausalito Cottage there. 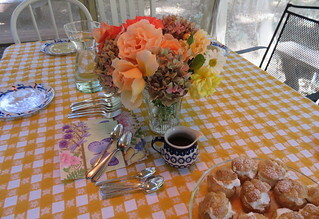 When we got back to Cathy's, she set up a lovely little tea in their outside dining pavilion. There were cream puffs and fruit and her neighbor made some lovely caramel sauce. 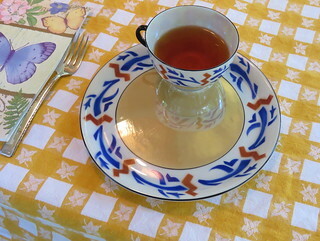 She'd cut the last of her roses from her Livermore garden to bring up, and it made for a lovely setting with her vintage lusterware snack sets. It was a lovely day out and I'm so happy that I was invited. Alice-Jane and I headed back at the end of the day feeling rejuvenated by the experience. Hope you're having a great week. Today I'm off to Holly's for the day. Seems like ages since I've been over to see her so I'm excited. What are you up to? In case I'm not back here tomorrow, have a wonderful weekend! Do you have any plans? Can't wait to hear about them! 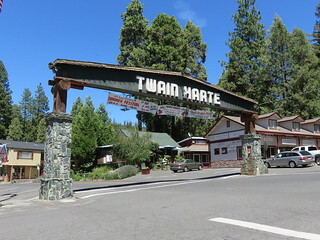 I love that town - I lived up in Sugar Pine when I was very young and went to school in Twain Harte and Long Barn. I have very fond memories there - I remember when Bonanza was filmed there - the stars would just walk around with the locals. Thanks for bringing back my special memories. Had a real touch of deja vu reading about your Twain Harte day trip. We used to do a two week summer rental there when we lived in Alameda. Years later when living in Oakdale there was nothing like a quick trip to THP (Twain Harte Pharmacy) for a quilter's "Fabric Fix")! !Next time stop at Knight's Ferry for a walk over the Stanislaus River thru covered bridge. You've had so many social engagements lately! Fun fun fun. Thanks for sharing. I've spent many years up in that area. 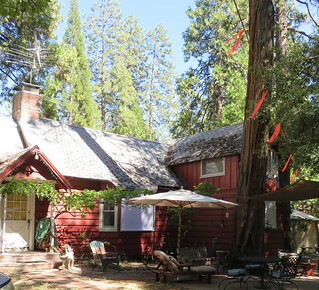 My in-laws built a home in Sugar Pine and, in fact, my father-in-law built a home for sale in Twain Harte. When my quilt group goes on retreat in Tuolumne, Saturday is always a trip to the pharmacy! That sounds like the perfect summer day! Hey Pammie! :) I was wondering if you would mind to email me, so I can email you back. :) Hahaha!!!!! I lost your contact info on our email since we're here with Nan and Paps. What fun! Cute cabin, too. I love the fabric section at the Pharmacy, too. I do hope they had PKM! !